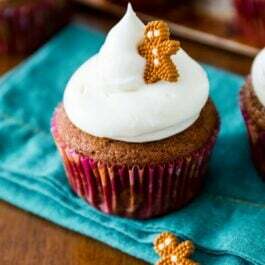 Spiced gingerbread cupcake recipe with tangy, sweet cream cheese frosting. Moist and flavorful, these homemade cupcakes are the perfect treat during the holidays! Today is our first snowfall! Only appropriate I make some wintery cupcakes to celebrate the snowflakes, right? Kevin has lived in both Colorado and Utah. He loves the snow. And Jude was born in Colorado, so he’s a natural snow bunny. I, on the other hand, can brave the snow if there’s a steamy hot chocolate waiting for me afterward. Don’t get me wrong, I love a fresh blanket of snow. But I once tried snowboarding (Kevin’s a natural) and got the wind knocked out of me. Ouch. I better stick to what I’m good at – cupcakes. Kevin described today’s spiced cupcakes as one of the best things I’ve ever made. Coming from the man who taste-tested all 75 recipes in my cookbook, as well as 95% of the recipes found on this blog – that says A LOT! 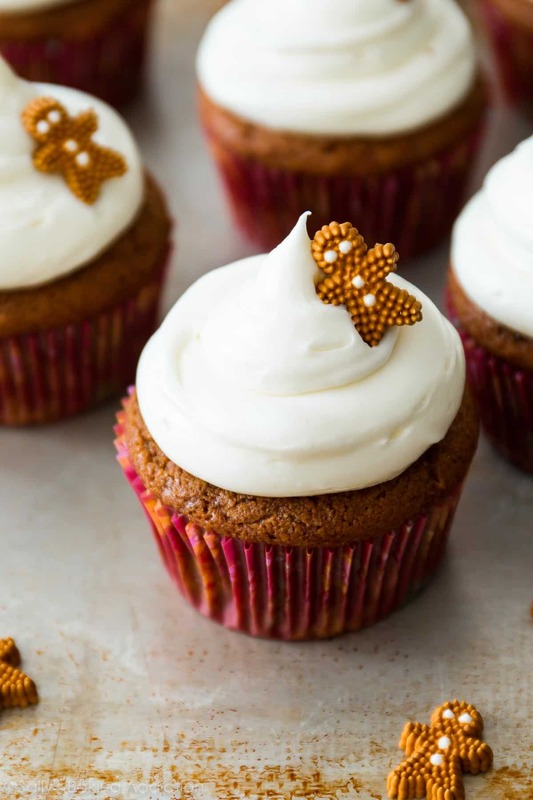 What may look like your typical gingerbread cupcake is anything but average. Deep inside each super-moist crumb you’ll taste cinnamon, ginger, and other warming winter spices. The taste of molasses is pungent, yet not overpowering in the slightest. Buttery and rich, these easy cupcakes are Christmas in a wrapper. There are no flavors I associate more with the holidays than cinnamon, ginger, and molasses. It took me a few tries to perfect this gingerbread cupcake recipe. I used some trusty trial-and-error techniques to find the perfect ratio of ingredients. The cupcake batter starts with creamed butter. Batch #1 was made with oil instead of butter. Oh my gosh. The batter separated and the cupcakes were so oily, they were impossible to pick up and eat! Batch #2 was made with less oil. Dry. Dry as a bone! Batch #3 was made with melted butter and more flour. Again, oily. Batch #4 won. Creamed butter! Brown sugar and molasses are the sweetening (and flavoring) agents in this cupcake recipe. Not only that, brown sugar brings moisture to the baked cupcake. 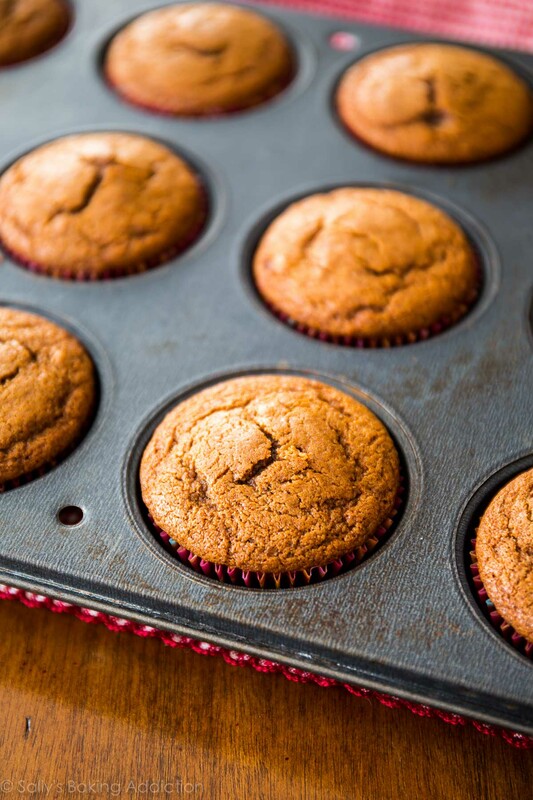 Since you’re not using oil (which is more moisture-rich than butter), brown sugar is a simple way to not only sweeten the cupcake, but to leave a moist texture as well. The rest of the cupcake ingredients are quite standard: flour, spices, milk, leaveners, egg. Use room temperature egg for this cupcake batter. Surely you saw what happened when I didn’t use room temperature egg in this cupcake post, right? Though not necessary for all cupcake and cake recipes, I prefer to use room temperature egg(s) when the rest of my ingredients are room temperature. This allows the egg to incorporate easier into the batter. 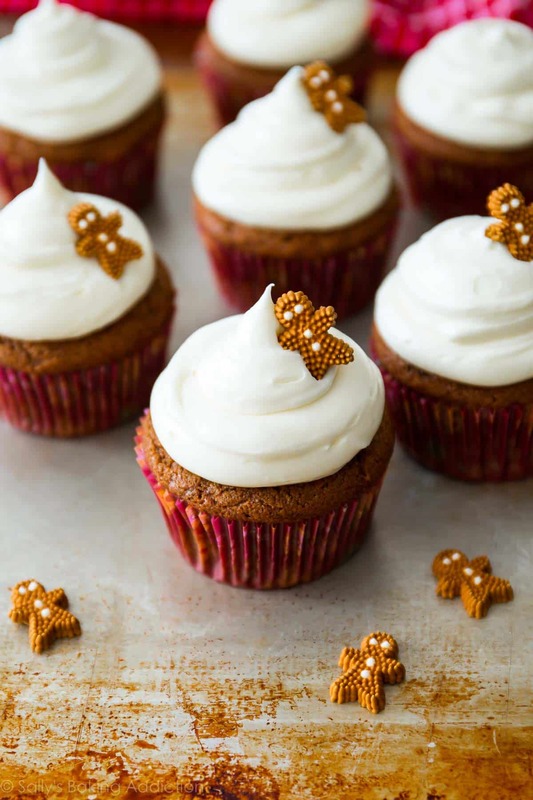 I top the flavorful gingerbread cupcakes with my favorite cream cheese frosting. The frosting is quite similar to the cream cheese frosting I slather on my Chocolate Gingerbread Bundt Cake. I simply increased the cream cheese for a thicker consistency. If you love cream cheese frosting, this is a recipe you need. Seriously, look how thick and creamy! ↑ Yes, that is a pink hand mixer. Yes, that is a pink mixing bowl. I knowww. Frost the gingerbread cupcakes – I used my Wilton #12 tip for piping, though you could simply frost them with a knife or your favorite piping tip. 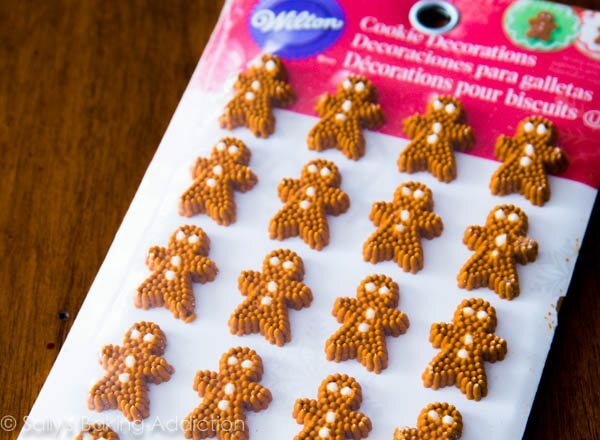 I know you’re wondering about the adorable little gingerbread men decor, right? They kind of steal the show. Found them for super cheap at Michael’s craft store. You can buy them here or even some adorable candy canes right here! 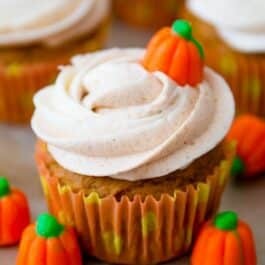 You could also decorate the cupcakes with festive holiday sprinkles, mini chocolate chips, or even flavor the cream cheese frosting with maple extract or a sprinkle of cinnamon. You could even do a simple whipped cream topping as well. I’m pretty certain gingerbread goes with everything. 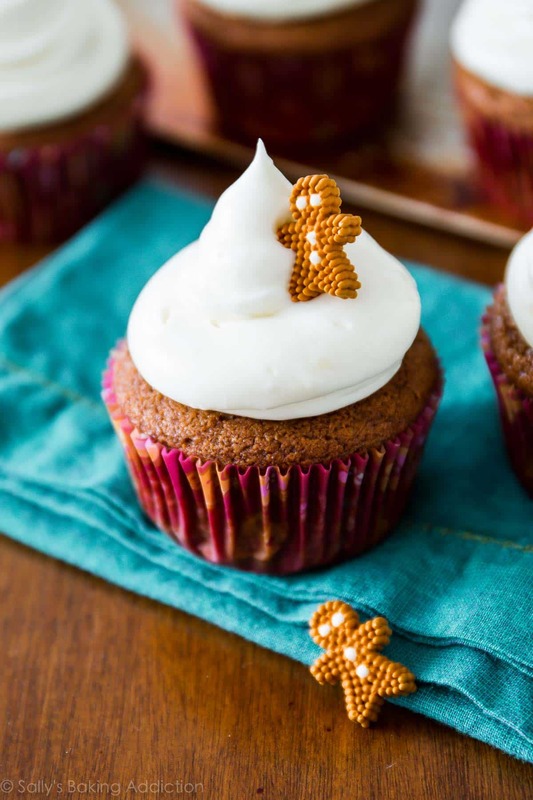 If you’re a gingerbread lover, you have to try these holiday cupcakes. Crowned with tangy cream cheese frosting, each bite is super moist and high in gingery flavor. Sugar and spice at its finest! PS: See how to make them mini size in my recipe notes below! Ok, enough reading – start baking! Preheat oven to 350°F (177°C). Line 12-count muffin pan with cupcake liners. Set aside. In a large bowl using a handheld or stand mixer fitted with a paddle attachment, beat the butter and brown sugar together on medium speed until creamy. Beat in the egg until combined, scraping down the sides and bottom of the bowl as needed. Beat in the milk, molasses, and vanilla on medium speed. Mixture will be piecey and not fully combined. That's ok. In a medium bowl, toss the flour, baking powder, baking soda, salt, cinnamon, ginger, nutmeg, and allspice together until combined. With the mixer running on low speed, slowly pour the dry ingredients into the wet ingredients. Mix until just combined. Scrape down the sides and bottom of the bowl as needed. Fill cupcake liners 2/3 of the way full, no more. Bake for 19-21 minutes or until a toothpick inserted in the center comes out mostly clean. Allow to cool completely before frosting. 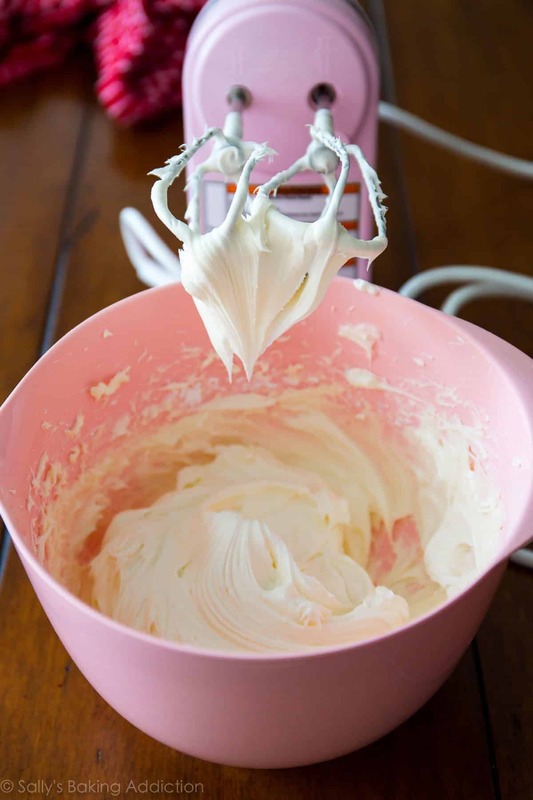 Prepare cream cheese frosting. Frost cooled cupcakes immediately before serving. Unfrosted cupcakes remain fresh covered tightly at room temperature for 2 days. 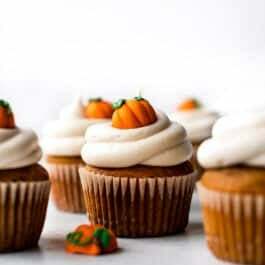 Store frosted cupcakes in the refrigerator for up to 3-4 days and allow to come to room temperature before serving. 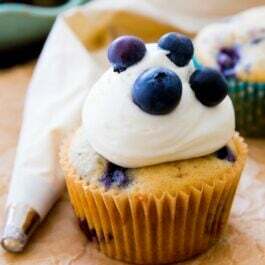 Mini cupcakes: To make about 30 mini cupcakes, make the cupcake batter as directed and bake in mini muffin pans for 10-12 minutes, or until a toothpick inserted in the center comes out clean. Want to make a cake? Here is my gingerbread cake with cream cheese frosting recipe. Egg and milk should be at room temperature. I used skim milk, though any milk would be fine. Buttermilk would be great! Some of the links above are affiliate links, which pays me a small commission for my referral at no extra cost to you! Thank you for supporting Sally’s Baking Addiction.